Hitwise has published a very interesting report about CGM – Consumer Generated Media. The report provides a detailed picture of social networking and video sharing websites. – In September 2006, the market share of visits to the top 20 social networking websites accounted for 4.9% of all Internet visits. This was an increase of 94% compared to September 2005. – Photobucket is the leading image hosting website, and its market share of visits has grown by 43% from March 2006 to September 2006. – The market share of visits to YouTube increased by 249% in the six months from March to September 2006, and in September was the 26th most visited website by US Internet users. – MySpace remains the king of social networking sites with 81.92% market share. – The share of upstream traffic from MySpace for the Telecommunications category was 89% greater in September 2006 than it was in March 2006. – An apparel and accessories websites like Hot Topic received 17.4% of upstream visits from MySpace, which was its leading source of traffic. Quite impressive numbers and a clear sign of the impact social networking sites have on consumers and businesses. Did Lunarstorm miss the boat? With these impressive figures at hand, you’ve got to wonder how the Swedish success community site Lunarstorm has been able to miss the social networking boom, or maybe they just peaked early. 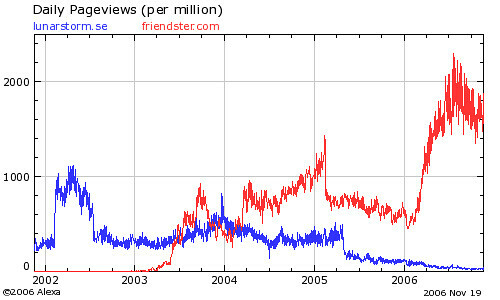 I did a comparison with Friendster which shows a depressing decline in usage of Lunarstorm. Now, I don’t know if Alexa’s numbers are anywhere near correct, but if they are, Lunarstorm is losing the battle. Statistics from KIA Index at least support the theory that Lunarstorm had more visitors in early 2006 than they do now. Does anyone know what the long term trend looks like?